Be careful about some of the advice you get about what equipment to take to the Galapagos. Everyone assumes that because the animals are so approachable you just need a mid-range or standard zoom. Things are much more complicated than that, and you should spend some time thinking carefully about what you bring and why. Fujifilm X-T1 and Olympus E-M1. Secondary camera (I was testing both). Three or four cameras on every trip. That may seem like a lot, but when you compare that to the amount you’ll spend getting to the Galapagos, you’ll notice that your camera investment still may only represent only a fraction of the travel expense. Besides, I’ll bet that you probably have most, if not all, the camera equipment you’ll be taking. Use my comments here to round out your shooting arsenal, if necessary. A quality, autofocus camera is useful in the Galapagos. 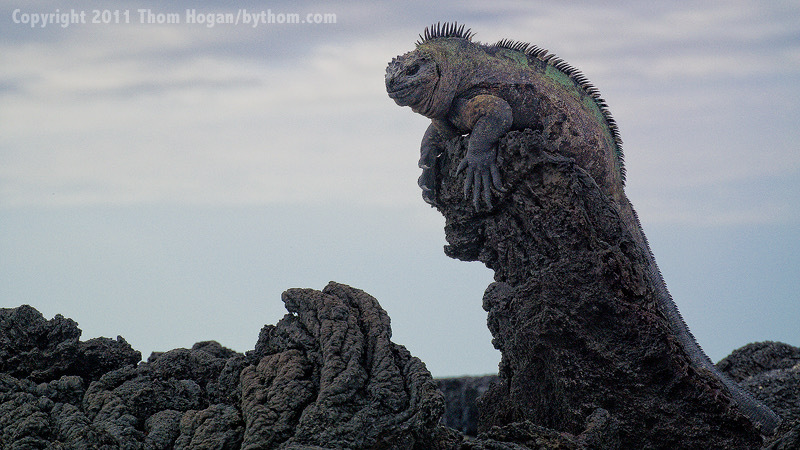 You’ll be surprised at how fast iguanas move when they want to, and along the cliffs you’ll want fast autofocus for the birds swooping and soaring. The fifty-one or thirty-nine sensor autofocus on recent Nikon bodies is quite useful, but don't be worried about needing the best possible sensor. There's plenty of light and contrast in the Galapagos, and except for birds in flight you'll have time to focus and reframe most of the time. You’ll want spot metering, exposure compensation, and probably exposure bracketing if you’re unsure about exposure, but most of the time you’re on the islands the exposure is Sunny 16 (f/16 at 1/ISO). The operative word is quality. The Galapagos are one of the prime photography sites in the world, and it is hard on equipment (we've got heat, humidity/condensation, water, and nasty volcanic rocks to deal with, amongst other things). You’ll want the best possible equipment with you that you can afford to bring. Weather-sealed cameras are better than non, but you still need to be careful about moving gear in and out of your air conditioned cabin to the visits. On our photo workshops in the Galapagos we leave our cameras out of our cabins whenever possible. Next in my required feature list is a plethora of information in the viewfinder. If you’re really taking pictures, you’re looking through the lens most of the time. You will absolutely miss any picture opportunity that occurs when you’re not looking through the camera. Thus, any camera that forces you to take it away from your eye to see what aperture or shutter speed it set is not good enough in my book. Fortunately, most newer cameras, especially Nikons, are pretty good in this respect. The more information you can see in the viewfinder, the better. I think that all viewfinders should include a Frames Remaining indicator, for example. Cameras that require you to hold them in front of you and compose on the LCD aren't as good for the Galapagos as your basic SLR or DSLR. The bright sun will make seeing the LCD difficult (hint: bring a Hoodman for the LCD and wear a large brimmed hat). Holding the camera out in front of you ain't so great either, as it makes it less steady. The exception to that is while snorkeling: holding your camera at arms length underwater works just fine. A word about metering, since you'll be thoroughly tested on setting exposures in the Galapagos due to the extreme conditions. The biggest issue is that there are white birds, and most of the terrain is deeply black lava rock. In other words, two extremes. Take the typical Galapagos penguin, for example. He’s black with white markings. If your meter mostly sees his black body markings (and he'll usually be standing against a black lava flow), the exposure the camera suggests will generally make him come out as some form of gray (no matter what you point the camera at, it assumes it is middle gray, so that the resulting shot ends up overexposed). If you’re lucky enough to get a real close up of an adult penguin’s face, the meter will see all that white and try to make it gray (underexposure). My solution in such circumstances is use the spot metering capabilities of my camera to find and set the exposure for something that’s about middle gray and is in the same light as the subject I’m shooting. Sometimes I get lucky and the rock the animal is sitting on will be about the right gray, sometimes I have to fake it and take an exposure reading off my hand (it’s about middle gray when it is isn’t too tan). Another way of dealing with exposure is the Sunny 16 rule (f/16 at 1/ISO). On the typical hot, sunny Galapagos day the right exposure won’t be far from that for things in the sun. Digital users have an advantage in that they can examine the histogram for an exposure and evaluate whether they need to make adjustments. One thing, though: you're on the equator and the sun is bright! If the LCD on your digital camera isn't easily readable in bright sunlight, get a Hoodman LCDLoupe or other shield so that you can see it. On many of the islands, there won't always be a place you go to "get in the shade" if you need help seeing the LCD. Also, if you’re wearing polarized sunglasses, that’s going to make it more difficult to see the LCD. Wear a wide brimmed hat and you can solve both problems. For what it’s worth, very few of the animals and plants in the Galapagos are anywhere near middle gray (the land iguanas and Galapagos Hawk qualify), so consider carrying a small gray card with you. Most of the birds are either white or black. Most of the reptiles are dark or light tan colored. The turtles and tortoises are dark. Most of the water-going animals, like the sea lions and turtles, are also quite dark (a few of the sea lions are light tan, which poses another problem on the sand). The settings youï’ll find the animals in ranges from black lava to white sand, with very little middle values in between. The sky ranges from foggy white to bright, but still quite light, blue. The ocean is generally darkly colored. You might think a matrix meter will take all that into account. Don't count on it, though the Nikon matrix meter does a decent job in the Galapagos (the other cameras I’ve used do a less good job, in my experience in the islands). More so than just about any place except the lava fields in Hawaii, I find matrix meters have a tough time figuring out the perfect exposure in the Galapagos. They'll often be close, but something about all that dark rock and dark animals and bright sky just isn't in their design to handle spot on. You should get the idea that you’re not shooting in a studio or a controlled situation. Spot metering, used correctly and judiciously, will get you better exposures than virtually any automatic mode of any camera I know. Of course, used incorrectly, you’ll end up with some pretty awful shots, so make sure you have some experience at using your spot meter before you travel. Nikon matrix metering does okay, as I noted, but older bodies tend towards underexposure in my experience on the islands. Many of the consumer DSLRs (the D80 is notorious for this), will tend towards overexposure in the Galapagos. The good news is that the Nikon matrix meters on the high-end bodies (D700 series, D800, D3, D4 models) do a decent job, probably because they are pretty good at dealing with white and black subjects. The consumer models (especially ones like the D3300 and D5300) tend to overweight what’s under the autofocus sensor too highly, so if that’s lava you’ll get overexposure but if it’s white bird feathers you’ll get underexposure. Bottom line: learn how to deal with exposures in bright sunlight with both bright and dark subjects. If you haven’t done this before, find a way to practice before you go. If in doubt, dial in a bit of exposure compensation (-0.3 to -0.5) on Nikon matrix metering. Manual film cameras aren’t a bad choice. More often than not you’ll have time to set manual exposure, focus manually, and make any other adjustments you might need to with an older, mechanical SLR. You might miss a picture or two from time to time while you fiddle with dials, but those of us with modern automatic cameras probably miss a shot or two when we trust the camera’s settings religiously. If the camera is more than a few months old, have it professional cleaned and checked before you head to the islands. Why? Because this is a once-in-lifetime trip, for one. You’re going to subject your camera to unrelentingly hot sun, high humidity, and blowing salt and sand, and probably in and out from air conditioning to not. All of this often conspires to push any lingering problems over the edge. Trust me on this. In five trips to the islands, I’ve seen six cameras die amongst 60 photographers (and yes, I loaned my backup body to the two who had Nikon lenses). I had a camera die on me while standing waist deep in water photographing the penguins swimming around me. If your camera is new (or after it has been cleaned), run some film through it (or shoot some memory cards) before you go. For example, stop by your local zoo and shoot a few hundred shots. Besides the camera testing, zoo shooting provides you practice shooting animals in reasonably close quarters. While you’re there, spend time making sure that you know how to quickly set exposure compensation, spot metering, and bracketing. Find some fast moving animals (or children) and practice focusing on their eyes. Under no circumstances should you arrive in the Galapagos with a camera that is in questionable shape or is brand new out of the box. You won’t find professional camera repair shops in Ecuador that can work on your camera—especially newer autofocus or digital cameras—nor will you likely find any (affordable) cameras you can buy to replace the ones you brought. That’s especially true if you use anything other than Nikon or Canon equipment. What you bring is what you’re going to have to use. Make sure you know how to use it and it’s in the best possible shape before you get on the plane. Worse still, when you get to the islands, you won’t find any camera shops at all. Indeed, during most of your stay, you probably won’t even be close to the few settlements that do exist in the islands. So even if they do now have a "camera shop", you wouldn’t be able to get there. If you’re taking a top-of-the-line body as your main camera, buy one of that manufacturer's lower-priced units as your backup. For example, if your main body is an F6 or F100, bring an F80/N80 or F90x/N90s as your backup. If a D7100 is your primary camera, bring a D5300 or D3300 as your backup. The key is to make sure that your backup can use the same lenses and accessories you bring for your main camera, and doesn’t change your shooting style or require refreshing your memory about controls. If you’re really price conscious—and who wouldn’t be after forking more than $6000 for airfare and boat accommodations—check the used department of your local professional camera shop. Not only will you find lower prices, but you might also be able to dicker the price down or get something extra (like a cleaning for your main camera) thrown in for free. If you think relying on one camera body is a gamble you’re willing to take, think again. Your shore landings will be at the whim of the sea. Some require you to wade ashore, albeit usually through shallow, gentle waters. While there are precautions you can take, your equipment will be in constant peril during your stay. If you manage to keep your camera from getting dipped into the ocean, there’s sea mist in the air, bird droppings (they always seem to hit the pentaprism of cameras or your head, sometimes both), dust and volcanic ash, and dozens of other culprits all ready to sabotage your photo equipment. Heck, I once watched my N90s go flying across the dining room when the Captain suddenly decided to race another boat on a crossing between islands. I usually take only my main camera ashore with me. That’s assuming that the ocean is reasonably calm. On panga-only visits and in rough waters, I usually take my backup camera instead. The rationale here is that if I’m more likely to lose the camera or damage it, I’d rather have to replace my backup than my more expensive main body. I’ll gladly sacrifice a few features for knowing that my most expensive investment in camera bodies is still safe and usable. Of course, the best possible scenario is to use two camera bodies that are the same. If your budget allows this, why not? That way you won’t be sacrificing features and won’t have to adjust for differences in the way the cameras work. But I’m not rich, and I suspect you aren’t either, so don’t despair if you have to use a second, less expensive body. I rarely take both cameras ashore with me. Again, the water landings are sometimes dangerous to photo equipment, as are a few of the paths you’ll be walking. It’s easier than you think to drop your equipment bag (even your waterproof one) into the water, or to fall while crossing a rocky lava flow. I’d rather not have all my equipment with me when I do that. Besides, you’re not likely to have to switch lenses quickly. You can only press one shutter release at a time, so I stick with a single camera at a time. You’re also moving constantly, so having extra gear around slows you down. If you absolutely have to have multiple cameras with you on shore, make one a simple compact camera that fits in your buttoned or zipped pocket (don't want it falling out as you're getting in and out of the panga). I’m often carrying a compact camera of some sort with me on the islands as well as everything else. I consider this my “disposable” camera because I use it in any situation that warrants a photo opportunity, no matter what the risk. I’ve waded into the water holding my point-and-shooter above my head, I’ve stood on rocky windblown ridges with it, I’ve set it on the ground and used a remote shutter release or self timer when I didn’t want to stay close to the animals, I shoot with it on panga rides, and I’ve dragged it with me through the dustiest of trails. Someday your “disposable” will break. Actually, that someday was the next-to-the-last day of my first Galapagos trip, when I was wading in the water trying to line up a penguin and the famous Pinnacle rock in the same wide angle shot. I didn’t get upset, though, since I knew that I’d already taken dozens of other pictures I wouldn’t have otherwise dared try with my more expensive equipment. Note that these days, many of the better compact digital cameras have optional waterproof cases, which I’d definitely bring to the Galapagos. Plenty of decent compact digital cameras are available these days. I like to shoot raw (and the extreme dynamic range in the Galapagos makes that more important than usual), so I’d tend to recommend cameras like the Panasonic LX-7, Canon S100/S110/S120, Canon G15/G16, Coolpix P7700/P7800, Sony RX-100 or something similar. Better still, the Canon G1x has a large sensor and you can get a low-cost underwater housing for it (<US$350). 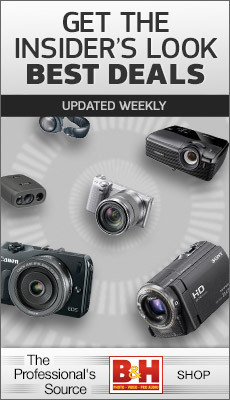 You'll find reviews on gearophile.com of many small compact cameras that are competent. Moreover, many of those have underwater housings available for them that won't cost you your first-born child to acquire. Of course, your compact camera might die the first time you wade into the water with it or try to drag it up a lava ledge. As the EPA says, your mileage may vary. Still, I consider US$400-800 camera a reasonable insurance to pay on a US$6000+ trip. Even if you end up never taking a picture with it, you’ll be glad you had the additional backup with you—the Galapagos can be that rough on equipment. Most of these cameras are compact, lightweight, and easy to stuff into a fanny pack or day pack with a extra things. One final advantage is that you can use this camera (which probably has some automatic and idiot proof mode) to hand to someone else, such as your trip leader, to get that shot of you sitting next to a tortoise or munching cactus with the iguanas. An underwater camera is optional, but strongly suggested. You’ll have a chance to do a lot of snorkeling in the Galapagos (bring your own mask; most boats have an adequate supply of fins you can borrow but their masks are often suspect; a lightweight wetsuit is a good option if you plan to spend a lot of time in the water, though I find I don't always need one for my typical one-hour swims, and most boats now carry extra wet suits with them, too). The snorkeling is sometimes absurdly great, though the water can be surprisingly cold on the Western shores. In one cove, we found ourselves swimming and playing with a half-dozen sea lions and literally hundreds of green turtles. I'll never forget the seeing a sea turtle suddenly swoop up out of the murky water to investigate what was making all that splashing commotion. Another time, I found myself staring at dozens of hammerhead sharks (only to be stung by a school of small jellyfish, dramatically shortening that dip!). If you don’t want to spring for an underwater camera or a housing for your compact digital camera, do rush down to your local film proprietor and pick up one or two of those disposable waterproof camera+film things Kodak still sells. They really work quite well. For US$20 you just might be able to get a few shots you otherwise wouldn’t. One step up from that would be one of the many compact waterproof cameras that are now available, such as the Coolpix AW110 or Olympus Tough. Personally, I use the Nikon 1 AW100 (not the Coolpix), and it’s worked amazingly well. To summarize, I believe that you’ll take better pictures if you bring the right equipment with you to the Galapagos. To my way of thinking that means multiple cameras, one of which is serious, higher end camera. You’re free to disagree, but if you do, make sure you know why you’re disagreeing before you jump to the conclusion that what you want to bring will do the job. Batteries. Take extra batteries. Most boats have plenty of electrical capacity, so you don’t need to bring solar panels or an excessive number of charged batteries. Still, forewarned is forearmed: except for a few of the big capacity DSLR cameras, I'll bet that you'll find single shore visits where you exhaust a battery while shooting. Have at least one extra fully charged battery for all your gear when you go ashore. Cleaning equipment. Soft rags for wiping salt air off the camera body are a must. I also take Q-tips for cleaning crevices. Digital camera users need to bring a full set of sensor cleaning tools. You’ll need lens cleaning solution to get sea spray off your lenses. Instruction manuals. Keep ‘em on the boat, but bring them. If you’ve ever had one of the newer cameras flash one of their cryptic error messages on the LCD you’ll know why—you’re not likely to figure out the problem without the manual or a hell of a lot of experience with the camera. Better yet, if your equipment is Nikon, may I be so humble as to suggest that you carry my Complete Guide for your camera? Carrying equipment. Since most site landings in the Galapagos have the element of water involved, I now use something like the LowePro DryZone 200 or Rover waterproof pack in the islands. This lets me carry all my cameras and lenses, an indecent amount of accessories, and even a change of socks and weather clothing.